Orbital ATK is proud to support our nation’s military by providing quality defense products and equipment in the field, but also through sponsoring events and donating to several charities across the nation. 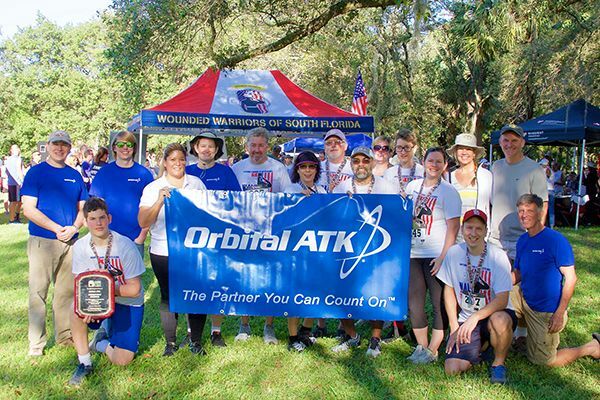 Over the past few weeks, employees from various offices have supported Orbital ATK-sponsored events in their community. Last week, in preparation for Veterans Day, members of Orbital ATK's Defense Electronic Systems Fort Worth, Texas, facility honored local veterans by cleaning headstones at the Dallas-Fort Worth National Cemetery in preparation for the cemetery's annual Veterans Day ceremony. 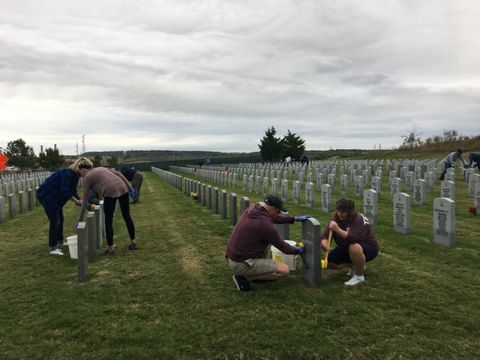 The cemetery has more than 62,000 headstones and Orbital ATK volunteers spent almost three hours scrubbing and rinsing over 4,500 of them. Left: Orbital ATK employees work to clean more than 4,500 headstones at the Dallas-Fort Worth National Cemetery. 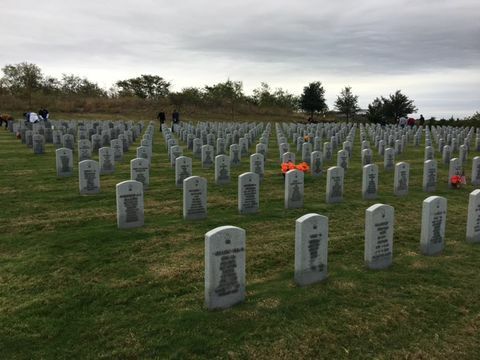 Right: The cleaned headstones ready for the annual Veterans Day celebration. 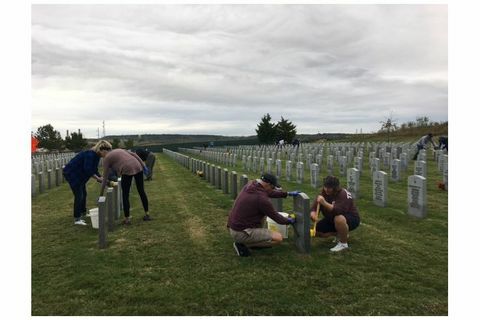 “This community service project was very humbling as it reminded us of the sacrifice so many have made for our country and it was truly a privilege to pay tribute to those that served,” said Brad Hayes, vice president of Orbital ATK's Special Mission Aircraft division. 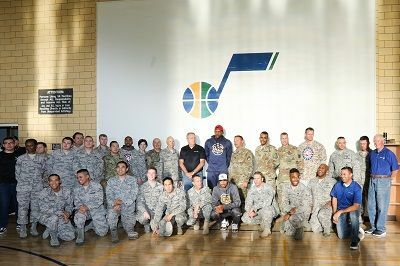 Earlier this month, Orbital ATK and the Utah Jazz basketball team hosted a hands-on Commitment to Service project for the second year in a row. 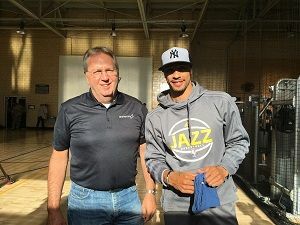 The event, presented by Orbital ATK, consisted of Jazz players, Jazz leadership and employees, and Orbital ATK employees and leadership working alongside local, active military members doing fall clean-up projects at the George E. Whalen Veterans Affairs Medical Center in Salt Lake City, Utah. 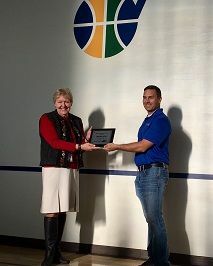 A newly-refurbished gymnasium, which includes new wall paint, a new basketball goal and backboard, and re-painted floor, was unveiled that afternoon after the clean-up projects were completed. A new, improved gymnasium was reveled at the event. Left: A spokeswoman from the VA Medical Center recognizes Orbital ATK for its Commitment to Service. Right: Orbital ATK employees and Jazz players work to refurbish the gym at the VA Medical Center. Across the country in Florida, the company sponsored the Wounded Warriors of South Florida’s second annual Run for Heroes 5k race in Jupiter, Florida. The race event hosted more than 400 runners and generated over $24,000 in proceeds to support veterans in need. Orbital ATK participated in all aspects of the planning, advertising, course preparation, staffing and running. A few of the Orbital ATK employees and family members who volunteered for and participated in the 5k race to support Wounded Warriors of South Florida. Wounded Warriors of South Florida is completely volunteer-based, which ensures that 85 percent of the funds raised go directly to those in need. Their mission is to provide temporary, immediate financial assistance to service-connected disabled veterans from Operation Iraqi Freedom (OIF), Operation Enduring Freedom (OEF) and Operation New Dawn (OND). WWoSF assists wounded warriors returning from these combat areas, while maintaining a high respect for privacy for the veteran and their families. 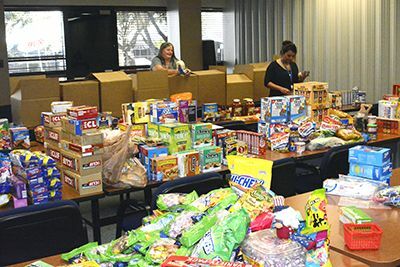 Over the summer, employees from Orbital ATK's Launch Vehicle Division teamed up with Any Soldier and gathered items for care packages to send to deployed forces. 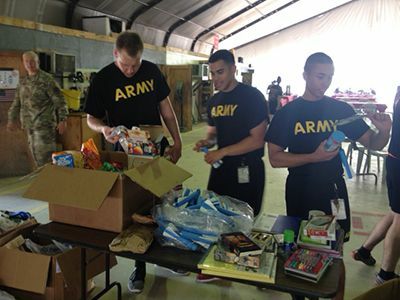 During the months of May and June, troops abroad tend to receive less packages, and employees wanted to help booth their spirits. Items collected included non-perishable food, clothing, letter writing supplies, personal care and other creative items.